the policeman is in front of the small structure. he is leaning 20 degrees to the back. the car is to the right of the policeman. it is facing right. it is morning. the plate is -1.1 foot above and -1.5 feet to the left of the car. the soda bottle is to the right of the plate. the small gold donut is 1 inch above the plate. it is face up. 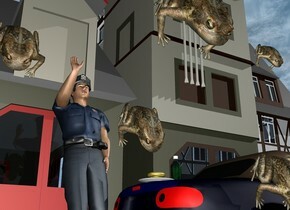 the first large frog is 2 feet in front of the policeman. it is 4 feet above the ground. it is face down. a second frog is 1 foot below and to the left of the first frog. it is face down. a third frog is a foot to the left and above the second frog. it is face down. a fourth frog is 3.5 foot in front of the policeman. it is 1.5 feet above the ground. it is face down. the small frog is 1 foot above the fourth frog. it is face down.